Here in this page you can download MediaTek or MTK USB driver. As you know to flash MTK phones you need to install USB driver first, so on this page you will find Auto installer MTK USB driver setup file and MTK USB driver file manual installer. 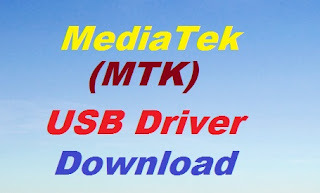 Here you can Download All MediaTek (MTK) USB driver. VCOM Driver, MediaTek Preloader Driver and MediaTek DA USB VCOM Driver, Please visit the below link to download MTK USB Driver. MTK_COM = "MTK USB Modem Port"
MTK_CAT = "MTK USB Debug Port"
MTK_PRELOADER = "MediaTek PreLoader USB VCOM Port"
MTK_SP_DA = "MediaTek DA USB VCOM Port"
This MTK USB Driver is compatible with both 32bit and 64bit Windows, download the MTK driver from the below link and install on your Computer to flash MediaTek (MTK) CPU phones.